I read about The Power of Play: Learning What Comes Naturally in Home Education Magazine today. While I haven't read it, this seems like a book I could agree with wholeheartedly. I have long maintained that children today do not have enough time to play, to engage their imaginations. Most children have lives that are structured from dawn to bedtime. David Elkind writes that "in our fast-track society 'play is being silenced'" and that it is all too easy to forget that "children can play safely without adult organization; they have done so as long as people have been on earth." One of the things that I love about homeschooling is that my children do have more time to play and cultivate their imaginations. David spends much time playing with his Legos, creating imaginary worlds and new creations. Isaac loves to skip around the house telling stories. He is often lost in his own little world. When we go to Bible Study on Fridays, they get to play with a whole group of boys. Today they were busy digging a huge hole in my friend's backyard (she had given her OK). While we adults might be called to help if someone gets hurt or is crying, for the most part they are on their own to work out their own disputes and decide on the rules of their games. They play with kids both younger and older than themselves and learn teamwork and cooperation. It is a beautiful thing to see and they are the better for it. I am very lucky to be able to live this homeschooling life with my children. 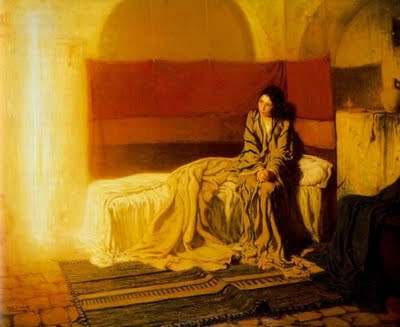 This is my favorite painting of the Annunciation. A copy of it used to hang in my spiritual director's office. It always seemed so inviting. The angel Gabriel is so calming - just a bright glowing light. Mary seems like the young human girl that she was - timid, uncertain where the road would take her. The colors are so warm. I always felt like I could be part of that painting. A couple days ago, I was flipping through the pages of "Antiques" magazine and came across this painting in an article about the artist - Henry Ossawa Tanner. This painting was completed in 1898. I was so excited to see the painting again and to be able to find it so that I could share it with you. I hope that you like it as well. Million Copy Give-Away of "Chili and Chocolate Cake"
Christian writer Joyce Schneider has written a few books on life. Most authors want to SELL a million copies of their books. She wants to GIVE AWAY A MILLION COPIES of her first book in E-Book Format. Chili and Chocolate Cake is not your average inspirational book; and is as unique as the title. The author shares her message of forgiveness, restoration, and hope for hurting women-- especially those who have experienced the loss of a child through abortion, miscarriage, or stillborn birth. This book is a shining testimony to the power of God to heal the broken heart. Author Joyce Schneider's dramatic life and the miraculous change from a tortured young women to a great woman of God will encourage every reader. God even used the stability gained from preparing chili and chocolate cake to weave the thread of His grace throughout her troubled life. Get ready for an outpouring--from the barren days of the past, to springs of living waters; rivers that will refresh long after you close the pages of this book. Just click on the link below for the details on downloading the E-Book. "Uncommon Trust in God" was written to celebrate the 125th anniversary of the Sisters of St. Joseph of Springfield, Massachusetts. Almost every Catholic life (and many non-Catholic lives) in this part of the world has been touched by a Sister of St. Joseph. Best known for their work in education, in recent years they have expanded their outreach and become fully dedicated to social justice issues wherever they may find them. Sr. Kathleen Keating, Ph.D. reflects on the past twenty-five years of the SSJ's history in this book. The study is interesting in many ways. For those from the Springfield, MA area, this book is a trip down memory lane. Readers will recognize many of the names of the sisters profiled in these pages. They will smile at reflections on the SSJ Craft Fair which for twenty years was a mainstay of the Columbus Day weekend. They will remember schools and principals and new buildings. They will acknowledge programs and places that continue to make the world a better place. They may recall how a special sister or two touched their lives forever. Those who attended Elms College will find the appendix on that institution particularly fascinating. Sr. Kathleen Keating is a former president of the school and offers a tremendous amount of insight on its recent history. From a broader perspective, it is a look at a congregation of religious sisters and how they adapted in the years after Vatican II. Sr. Kathleen examines how their lives changed in terms of how they lived and worked and governed themselves and carried out their mission. There were definitely growing pains, but Sr. Kathleen and most of the other sisters agree that the changes were for the best. They have learned to cope with an aging population and declining membership. They have found ways to continue to be relevant to the world. They have found ways to raise money and utilize their properties in order to care for their own. Through it all, they have retained their "Uncommon Trust in God." "Each Sister of St. Joseph is a teacher. They teach by example, by that mysterious power that goes out from them like a light from a lamp, heat from a fire, and perfume from a flower. They teach by their presence in classrooms, in soup kitchens, in shelters for abused women, in their tireless advocacy for the poor, for human rights all over the world and here at home on behalf of America's new migrants and immigrants . . .They teach us when they ask, 'What are you as a Christian doing . . . ?'" "Uncommon Trust in God" is a wonderful book for anyone interested in the Sisters of St. Joseph of Springfield or those who wish to learn more about religious sisters over the past twenty-five years. This week’s Gospel is one of many illustrations of Jesus’ power to heal. These miracle stories usually share some common elements. The person approaches Jesus with firm conviction that Jesus can fix whatever it is that ails him or her. Jesus then performs this service, healing not only the body but also the soul. Lastly, Jesus comments on the person’s faith. It is the faith that saves the person. The person believes. I am reminded of Jesus’ words to Thomas in the Gospel of John “You believe because you can see me. Blessed are those who have not seen and yet believe.” (John 20:29) Obviously, those of us who practice our Christian faith 2000 years after Jesus walked the Earth fall into the second category, but believing without physical proof is not always easy. I've heard it said that faith is a gift given from God. That may be true. Perhaps some are given a greater capacity for faith than others. I think that all are capable of some measure of faith, however. God would not have created a person and made him or her incapable of believing in God. That doesn't make sense, especially in light of the fact that our main purpose for being is to know, love, and serve God. Therefore, it has to be possible to intellectually choose to have faith, to believe even when one doesn't have the feeling of belief. St. Therese did this in her last days. She doubted there was a heaven. Yet, she still chose to believe. Blessed Teresa of Calcutta did this as well. She had no consolation from prayer, yet she continued to pray and continued to believe in her mission from Christ. I have heard so many takes on this Gospel. We all have blindness in our lives that needs to be removed. We are blind to the beauty of the world around us. We go through life with blinders on - looking, but not really appreciating the magnificent creation around us. We are blind to the needs of others. We focus on our own needs and wants and somehow miss how we can help those who share our lives who are in pain. We are blind to our own faults. We choose to overlook the shortcomings in ourselves, but are quick to point out the failings in others. Oh yes, we are all blind in some way. Sometimes, however, I think that our greatest blindness is our failure to see God in our everyday lives. A spiritual director that I once had used to ask me "Where was God for you today?" It is such an important question, and one that we often overlook. We get so busy in the minutia of life, in the chores and the work and the responsibility, that we fail to notice God amidst the rhythm of daily life. Then, when the world comes crashing down around us, we wonder "Where is God?" God is there all the time, in both the good and the bad, but we need to open our eyes and quiet our hearts to see. We need to choose to believe even when we don't feel like it. Dear Lord, please help me in my blindness. Help me to see you in each and every day, and to acknowledge your presence in my life. Lord, I believe. Please help my unbelief. The trend in traditional education these days is that more is better - more hours, more days, more instruction. The local Catholic elementary school lengthened the day by an hour this year. The students (including Kindergarteners) now get out at 3:30. Most get home around 4 pm. Those who play sports or having evening activities have to be out of their homes by 5 pm. After these activities, they have to go home and do their homework and then get ready for bed (probably too late to be fully rested to get up the next day and do it again). These children have no time for imagination. Almost every moment of their day has consisted of structured activity. I am not anti-school. I'm glad that there is the option of free education in our country. I strongly support Catholic schools. I know several teachers who are dedicated and hard-working and go in every day and do the very best that they can. However, they simply cannot provide every child what she or he needs to be the best she or he can. Homeschooling is incredibly more time-effective than traditional schooling. Children who are homeschooled have the time to pursue their own interests and the down-time to fully develop their imaginations. I see this every day with my own children, but I also witnessed it the other day in my friend's daughter. She is 10 years old. The other day, I was sitting at the sidelines of soccer practice doing some of my own work and she came and sat beside me, notebook in hand. She was working on writing a story. She had committed herself to working on it 10 pages every day. She sat there diligently writing, happy as could be. She was on page 73 when the practice was done. All I could think was that if she were in traditional school, she would never have the time to do this. She might have the idea for the story and even the desire to write it, but she wouldn't be able to, because her life would be filled up with things that other people think are important. Homeschooling gives children the gift of time. Contrary to what the educational experts seem to think, sometimes, in education, less is definitely more. Book Review: "The Angelic Way"
Angels have captured the imagination of humanity since the beginning of time. 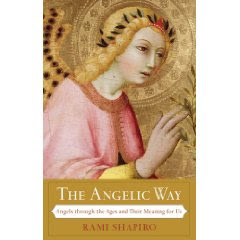 Rabbi Rami Shapiro seeks to examine and explore the mystery of angels in his new book, “The Angelic Way: Angels Through the Ages and Their Meaning for Us.” He uncovers the shared myths about angels that exist in all the major religions of the world and contrasts and compares them. He emphasizes that myth does not mean “made up.” Rather, a myth may very well be rooted in reality. The purpose of a myth is to “bring about a transformation in the person wrestling with that myth.” Angels are meant to transform us, to bring us into closer contact with God, our Creator. Angels help lead us away from the notion that we are separate from God, an individual unto ourselves. They show us our interconnectedness with all the other beings on Earth and indeed, with God Himself. Shapiro’s study is fascinating. While he does spend a great deal of time explaining the Jewish understanding of angels (understandably so), he does a very good job of researching how angels are portrayed in all the major religions of the world. The commonalities are striking. He also shows how the understanding of angels has changed over time. His chapter on “Satan, the Fallen Angel” is particularly interesting. He shows how the concept of Satan has developed through the ages. The idea of Satan predates Jesus by over a thousand years and has its roots in Zoroastrian mythology where he acts in opposition to God. In contrast, the Hebrew Scriptures present Satan as one who acts at God’s command or as “agent provocateur” (witness the book of Job). Satan can only suggest things. People choose to act. It is only in Christianity that Satan becomes capable of possessing people and forcing them to act. Shapiro also devotes considerable time to exploring how angels have appeared as humans, the archangels, and the angel of death. He also delves into “the ascended ones” – humans in the various faith traditions who have been granted access to the next realm and then return to help those still in this realm. Elijah in Judaism, Mary in Christianity, and Muhammad in Islam all fall into this category. Shapiro’s last chapter is devoted to “Lectio Divina and the Angelic Way” to invite readers to meditate on the angelic myths and learn from them. “The Angelic Way” is very interesting. While some of Shapiro’s ideas are dangerously close to Pantheism, there is still much to be learned from these pages. Perhaps the most important lesson is that angels are for all of us, regardless of our religious tradition. 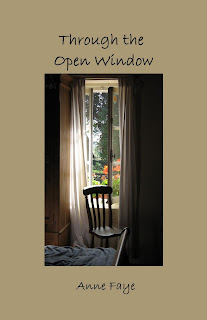 "Through the Open Window" is now available! I am helping spread the word about a debut novel from Anne Faye, a friend of mine. "Through the Open Window" tells the story of Lucy Lyons, a woman trying to escape her past. Content to work as a librarian and live alone with her dog, all she wants is a simple life with no complications. When she decides to take the plunge and begins to write a novel during National Novel Writing Month, she gets much more than she bargained for. Her writing will not only force her to face her own secrets, but will also put her in the path of a handsome artist who shares her love of the written word. “Through the Open Window” is an engaging Catholic novel about the secrets we all keep and the hope for second chances. If you are interested in writing a review for your blog or Amazon.com, please contact Anne at AnneMFaye@gmail.com. A limited number of review copies are available. Also, please help spread the word by sharing this message! Thank you! Hardly anyone lives the life they dreamt of or expected to live when they were younger. We all have those visions of perfect spouses, dream jobs, luxurious homes, and adoring friends. Then reality hits and we are disillusioned as we struggle to adjust. I’ve come to realize that it’s important (if not vital) that we learn to let go the dreams of our youth. We need to grieve what’s been lost. If we lose a parent and don’t have grandparents around for our babies – we need to be able to grieve the dreams we had of loving grandparents who lavish our children with love and gifts. If we dreamed of having children and find that we can’t – we need to be able to grieve that fact. Just because our lives don’t turn out the way we dreamed they would be doesn’t mean they can’t be fun, enjoyable, or even bring us great joy. It’s okay to grieve the loss of something in your life; as long as grieving it doesn’t become a lifelong thing but allows you to move on and embrace what you have been given. I was given a wonderful husband. He has taught me so much and he loves me unconditionally. I am so blessed to have him in my life. And yet he was married before me. I ended up becoming a full-time custodial stepmom at the age of 23. We never had time to just be newlyweds without a child around. And there were other dreams I had that didn’t quite line up to God’s will for me either. It doesn’t mean I love my husband or my stepson any less to be able to mourn the loss of certain ideals and dreams that I had in my heart. In fact, it truly allows me to love them more. For if I hold onto the “wishes” and the “what if’s,” then I’m only holding myself back from my reality. A reality that has touched my soul and made me a better person. You can’t go back and change life. You can’t live the way you dreamt of living if certain people, circumstances and “fate” change the course of your life. It is what it is. But you CAN reconcile some things within your heart. You CAN grieve over what was lost so that you are able to hold tenderly what was brought to you instead. It’s okay for us to have dreams. We encourage our children to have dreams. But we need to realize that often life has detours and God may have other things in mind for us. It’s what we do with these changes in course that truly matters. For me, I wouldn’t be half the woman I am now without the change in course that God brought into my life. I’m thankful for the lessons and growth He has showed me through the different direction He took me in. And I’ve found in the process that new dreams have replaced the old ones – better, more passionate, and cherished dreams. I’ve chosen to make the most of my life and to see what God sees in it… the good, the beautiful, the rich, and the memorable. It’s every bit (if not more) better than any of my dreams could have ever been. I think that all of us can see ourselves in James and John in this Gospel. It is only normal to want to be chosen for the place of honor. We want to be acknowledged. How many of us have waved our hands and yelled (or at least thought) “Pick me! Pick me!” at some point in our lives? I’ve been there more times than, in light of this Gospel, I care to admit. by Quentin Hakenewerth, SM. The very beginning of the book invites the reader to develop one’s true self and set aside one’s ego self. According to Hakenewerth, the ego is the part of us that believes we are the source of our own worth. “When we live out of our ego, we feel worthwhile only to the degree that we can attribute to ourselves – or get others to attribute to us – some achievement, merit, or credit.” Our ego is always searching for the next vote of approval. Hakenewerth shares a story of a religious sister who encountered a four-year-old girl at a Family Renewal conference. The sister asked the little girl what she had learned that day. “Oh, we learned about the old self and the new self,” the little girl responded. “When I am selfish, that’s my old self. And when I love others, that’s my new self.” The little girl had it all figured out. We are thrilled to announce that on Monday, October 19, CatholicMom.com readers will have the first opportunity to read the brand new novel Sweet Dreams, by noted Catholic author and CatholicMom.com contributor Katherine Valentine. Many of you join me in my great admiration for the work of this wonderful Catholic novelist. Katherine Valentine’s widely read novels explore God’s response to our prayers in times of need. They include: A Miracle for St. Cecilia’s; A Gathering of Angels; Grace Will Lead Me Home; On A Wing and A Prayer; The Country Fair and The Haunted Rectory. All can be found in major bookstores and on-line. Be sure to join us on Monday morning, October 19 at 10 am Pacific time to begin reading Chapter 1 of Sweet Dreams here on the website. New chapters will be added weekly as we enjoy this delicious new novel together! Please tell your book loving friends and join me in thanking Katherine Valentine for this wonderful new addition to the literature she has created. 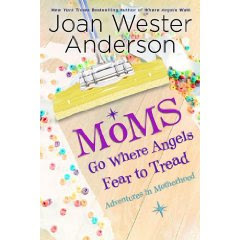 Book Review: "Moms Go Where Angels Fear to Tread"
New York Times best-selling author of "Where Angels Walk," has turned her attention to motherhood in "Moms Go Where Angels Fear to Tread: Adventures in Motherhood." Anderson is the mother of five grown children. As such, she has much wisdom and experience to impart to those of us still in the trenches. For example, "If you rely on God's help and second on your own good instincts, you'll be happier for it." Anderson regales her audience with humorous tales of her own experience of motherhood that will have fellow mothers nodding and laughing in agreement. Anderson tackles such topics as attempting to remodel a house, the stress that is the month of February (how can such a short month cause so much trouble? ), sending children to school for the first time, taking children to the doctors only to have them be miraculously healed in the waiting room, and watching a child perform onstage for the first time. Anderson concludes each chapter with a wise quote regarding the topic at hand. One of my favorites was from Father Ron Rolheiser: "A mother rearing children . . . is forced, almost against her will, to constantly stretch her heart. For years, her time is never her own, her own needs have to be kept in second place and every time she turns around a hand is reaching out and demanding something. She hears the monastic bell many times during the day and she has to drop things in midsentence and respond, not because she wants to, but because it is time for that activity and time isn't her time, but God's." "Moms Go Where Angels Fear to Tread" is an enjoyable romp through the experience of motherhood. It will both make you laugh and tug at your heartstrings. of all who love and venerate you. I have special confidence in you. never abandon your faithful servants. who are dear to me to your intercession. and assist me at the hour of my death. the arms of Jesus and Mary. 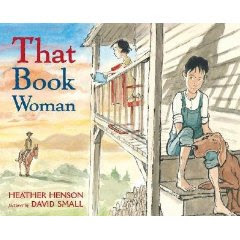 Book Review: "That Book Woman"
I read "That Book Woman" by Heather Hansen (pictures by David Small) to my two boys yesterday and just fell in love with it. This work of fiction was inspired by courageous work of the "Pack Horse Librarians" who were known as "Book Women" in the Appalachian Mountains of Kentucky. These women would travel through all sorts of weather to bring free books to families to read. Every two weeks they would come to take back the old ones and bring a new set. In "That Book Woman" the main character Cal really doesn't see the point of "The Book Woman" or books in general. By the end of the story he has changed his tune. He swallows his pride and asks his sister to teach him to read and he discovers the magic of books. As someone who loves books and the magic of the written word so very much, I was touched by the message of the value of literacy. I was also impressed by the lengths these women went to in order to share books with these rural communities. This is a wonderful book to share with your children! It is important to note that while St. Teresa’s words were originally intended for those living a consecrated religious life, her teachings have meaning for each of us. Few of us will ever reach the summits of union with God that Teresa experienced. Those of us who live in the world are called to a different way of life and have different obligations. Yet, all of us are invited into a deep relationship with God. Our entire reason for being is to know, love, and serve God. Everything else: our relationships with others, the work of our hands, and the mark we leave on the world, flows from that. Prayer is the key to that relationship with God. As we celebrate St. Teresa’s feast day, let us reflect on the way she pointed us to God, and invited us into deeper communion with Him. Through her teachings on prayer, she helps instruct us on how to progress in the spiritual life. October 9th is Cupcakes for Life day! The Cupcakes for Life website asks the question: "What is worse than being in third grade and not having anyone celebrate your birthday?" The answer: "Not being born." Cupcakes for Life is designed to be mainly for students in high school and college to help raise awareness among their peers about the pro-life movement. Support "Cupcakes for Life" Day! How Can I Become Like a Little Child? As I write this, I am coming down with a cold. I feel lousy. I want nothing more than to crawl into bed and have someone take care of me. That’s not an option, however. In fact, not only do I not have the choice of collapsing into bed, I need to care for my older son who is also sick. He needs me. I am the grown-up in this equation. I have been the adult and the mom for quite some time now. My childlike innocence left me a while ago. Life is a challenge. There is work to do, a house to take care of, and a family who depends on me. I am thankful for all of those things, but my adult responsibilities and worries are real. But, then, I am confronted with this Gospel, which tells me that I need to become like a little child. I want to tell God, “But I am not a child! I’ve been there and done that! Those days are done.” I then try to evaluate it from the perspective of being a mother. I look at my children, and wonder, “What age child are we talking about here?” because I am not sure that my children at ages 8 and nearly 7 fit the description. In fact, thinking back to their toddler years and the way that they could protest going to Church with a volume level that could cause hearing loss, I’m not sure that they ever did. Still, there has to be some meaning here for me. What could it be? What is Jesus trying to tell me today? I need some help with this one. Amy Welborn, writing the Living Faith reflection for Sunday, tells how she had taken her toddler daughter in the car and gone for a ride to the beach. Welborn shares, “We arrived, and she played, delighted as I sat and pondered. All this time, she had never questioned where we were going, never fought it. She had just come along for the ride, accepting and happy. . . She trusted that I loved her and would only want the best for her.” Welborn’s daughter’s trust is like the trust I need to have in God. Do my children trust? Yes, they do. I’m far from perfect, but I have tried to be a good mother. I can’t take away all their problems, but I have tried to have them feel safe and secure in my love. I think that I have succeeded in that. Then, the question becomes, “Do I trust in God’s love? Do I believe that God loves me and only wants the best for me? Can I be like a child trusting in a parent’s love?” The honest answer is “sometimes;” maybe even “most of the time.” Still, I obviously have some work to do in this area. The homily at mass Sunday focused on dependence on God. Small children need someone to take care of them. No matter how much my six year old tries to tell me otherwise, I know that he needs a mother. Dependence means that I need God. Regardless of how much I would like to think so, I can not make it on my own. This I know. I know that if God stopped thinking about me for even a second, my very existence would cease. It doesn’t mean that sometimes I don’t try to go my own way for a while, however. I sometimes think that I know better than God what is good for me. That road usually ends in a real mess, which I then have to lean on God to help me get out of. Sometimes the consequences are irreversible. Yes, I need to depend on God and pray that I do his will, not mine. Even in the midst of being adults, this Gospel calls us to become like little children. It invites us to trust in God’s love and to depend on Him. This isn’t always easy, but I am a work in progress. I will keep trying! It is widely believed that these promises were given by our Blessed Mother to St. Dominic. 5. Those who recommend themselves to me by the recitation of the Rosary shallnot perish. Happy Feast of St. Therese! She is one of my all-time favorite saints, and the one my mother always considered to be my patron saint.